The Thirsty Dog Folk Club has been rebranded The Barebones Acoustic Folk Club and relocated to the Auckland Irish Society at Fowlds Park Western Springs. Unfortunately, they weren’t available for this coming Sunday, so the Pipis won’t be appearing. We’ll be working with the club to reschedule for 2018. We are pleased to inform you that PIPI PICKERS has been selected to play at the EWOB 2016 festival in Voorthuizen, The Netherlands, which is held from Thursday May 5 (Ascension Day) to Saturday May 7. Could you please confirm that you will still be traveling to Europe and be able to perform during the festival before February 1? This enables us to complete the festival program. We are looking forward to seeing you at EWOB and we’ll be in touch with further details in the next few months. Oh, if only we had the time and money to go! Wouldn’t that just be a hoot?? Living, as we do, in the remote rural reaches of New Zealand (though, technically, still within the Auckland Super City, explain that one to me) our internet bandwidth and speeds make sharing video difficult. It takes about 4 days to upload a single video. I am not exaggerating. But we are struggling through and have managed to upload five songs so far from Mountaingrass 2015 in November. The video was shot by Roger McKenna and is of very good quality. We hope you enjoy it, and we’ll try to add more soon, so check back once in a while. Finishing 2015 off with a bang! Today (November 15th) is the first of our last three gigs for 2015. We’ll be at the Thirsty Dog Folk Club on K’Road this afternoon. On Thursday we’re off to MountainGrass! Yay! We’re really looking forward to seeing headline act Laurie Lewis and the Right Hands. But most exciting of all, Garry will be picking up his custom made Duff mandolin. Two years in the making, this one looks to be a real beauty! Added to Nat’s custom Bellbird Banjo and Barry’s brand new De Gruchy guitar, we are sporting some fine Australian made instruments! The finest available, we think. Now, if only we could afford a Benedict G Puglisi bass for Jenine! 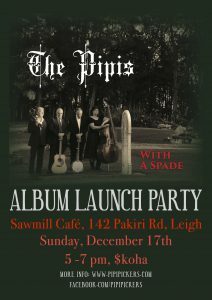 Our last show for the year is at our local, The Leigh Sawmill Café, as is only appropriate. We’ll be there on Sunday, November 29th. We’ll also be at the Whangateau Folk Club on November 30th. Not technically a gig, but we will be doing a couple numbers, and look forward to seeing all our friends and neighbours there! I don’t know what they were thinking, but Pipis are on the programme for Wellyfest 2015. All the bivalves are looking forward to catching up with the southern contingent. There will be many jams. If you want to catch the Pipis at Wellyfest, be prepared to getting up at early. Our bluegrass slow jam workshop is on at 10am on Saturday, and our main stage concert is 10am on Sunday. We’ll also be in the first half of the final concert Sunday night. Check out the rest of the schedule, the artists this year are AMAZING. What a festival it’s going to be! It’s official, Pipis are the overseas guests for the Wirrina Bluegrass & Acoustic Roots Festival – September 4th-6th 2015. We are pretty excited about this. Some friends of ours went last year and they just raved about it, so we had to get in on that action! They have a new venue this year, the Wirrina Cove Holiday Park http://www.wirrinacoveholidaypark.com.au/ which looks very nice. They’re also looking for volunteers, if you’re the kind of person who likes to experience the festival from behind the scenes. Email them if you’re willing to help in return for your ticket. Tickets are available now at www.wirrinabluegrass.com with a discount for booking online. This is the message the Animal Sanctuary sent out in their e-mail newsletter after we played for them at their annual supporters picnic. Playing music for an afternoon seems a tiny and insignificant donation in the face of the great work they do there rescuing and rehabilitating native birds. They are a cause worth supporting! We truly enjoyed having a good number of our Sanctuary Supporters visit on Sunday for a tour, picnic and live music. It was wonderful to meet so many of our Supporters in person. Most had never been here before, so it was a treat to be able to show them around and introduce them to the animals. The weather started off a bit dark and gloomy with spots of rain, so we moved the whole gig indoors. The band put away their PA system and played “unplugged”. But during the tour the sky brightened, the sun came out, and the picnic was outdoors in the sun after all! Perfect. Special thanks to our Supporters who made the trip up; to my husband Michael and wwoofers Barbara & Riccardo, who spent many hours spiffing up, mowing lawns, cleaning windows etc (there’s nothing like visitors to bring on a good spring clean! ); to Dayna & Quinten for baking heaps of scrumptious cruelty-free cakes and cupcakes; to Kirsty & Kris for all their help before, during and after. 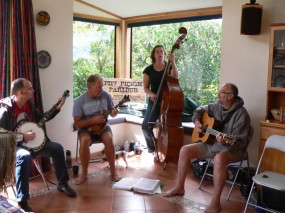 And especially to the wonderful blue grass band, The Pipi Pickers, who provided such fabulous music for our event. Much appreciated, everyone!! “As Is, Where Is” is now available! It’s been a long time coming, but it looks like we’ve finally done it. We have a recording. And you can have it too. Buy a physical copy direct from us, or download immediately from Bandcamp. We are really pleased with how it’s come out, and we hope you’ll like it too. We owe a huge debt of gratitude to Micheal Young for his work recording, mixing and mastering. We highly recommend using his Studio27a for your next recording endeavour! 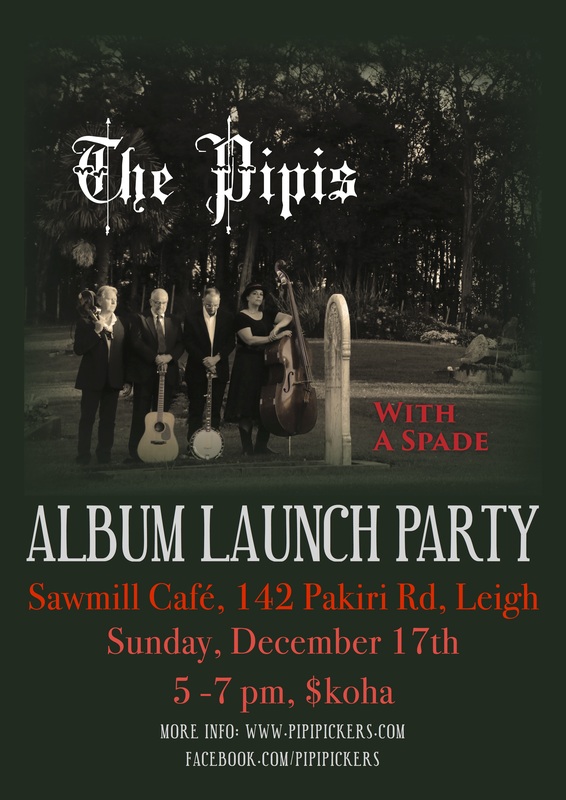 We’ll be hosting a release party for all our friends and family at the Leigh Sawmill on the 8th of December. We hope you can join us! On the one hand, it feels like we’ve hardly been playing at all this year. On the other, we’ve played three festivals so far, two of which were in Australia, and we’ve got one yet to do, again in Australia. AND Our record, “As is, Where is” is OUT and available. We don’t have an order page or system set up. Just e-mail me. I’m working on getting it available for download through Bandcamp. But we’ll probably just sell the physical CD ourselves, seeing as they’re here in the living room. In news: Redlands was great! So much fun! Queensland is lovely and warm and so are the people who live there. We played our best for them, too. Hoping to have video from the show up and available soonish. Funny thing happened while we were warming up for the Friday night concert. As we played, we were joined by an angelic voice which turned out to belong to the lovely and talented Isabel Patton of the Kissing Cousins. She’s a fiddle player, a great singer who really really only wants to sing harmony, and stunningly beautiful to boot. And so are her boots. We asked her right then and there to join us for a song (Lucinda Williams’ “Can’t Let Go”). She is officially the Fifth Pipi. We’re looking forward to her playing fiddle and harmonizing on more songs with us at MountainGrass in Harrietville in November! We’ll be putting some pictures on Flickr from the festival, and they’re already on Facebook, if you’re so inclined, feel free to visit us there. Don’t forget to hit that infernal “Like” button.